Decorative Ceiling Medallion - 18-1/2-Inches Wide Dainty shells and bell-shaped flowers trim the perimeter of this otherwise simply-styled ceiling medallion. A lightweight polymer material makes it easy to install, and an unfinished surface means you can choose to color the disc according to your decor. Has an 18-inch diameter. Makes a charming accessory for your favorite overhead fixture. 18.5 in x 1.12 in. 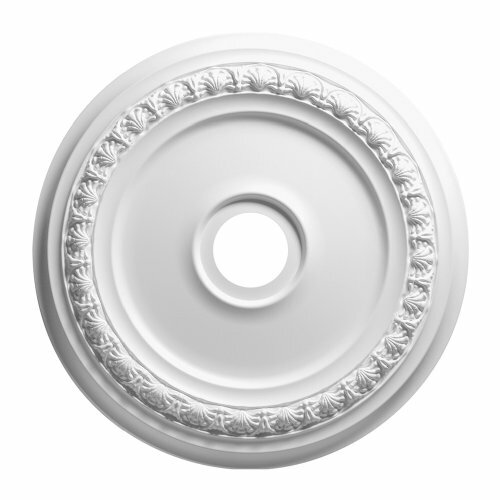 Focal Point Decorative Ceiling Medallion - 18-1/2-Inches Wide - White Resin Ceiling Light Accessory - 18.5 in X 1.12 In. If you have any questions about this product by Focal Point, contact us by completing and submitting the form below. If you are looking for a specif part number, please include it with your message.